TraveLibro is a promising new travel start-up in India. I have been active on this platform for past few months and this post summarizes my findings about TraveLibro. While we have popular players covering various specific aspect of travel-such as reviews, flight booking, hotel booking and so on, there hasn’t been one stop shop that covers the entire travel experience- from planning your trip, booking flight and stay, experiencing the travel and then finally sharing your experience. TraveLibro attempts to bridge this gap, by bringing together travel enthusiasts who are keen to travel, globetrotters who have already been to several places around the world and service providers (flight, hotel etc) on one single platform. To begin with, someone thinking about travel can browse through a huge collection of already published itineraries. These itineraries are from editors of TraveLibro as well as the personal experience of the travelers and way more reliable than commercial itineraries that can be seen on other travel sites. Itineraries help one to explore a destination (TraveLibro has a collection of 3000+ itineraries spanning 1200 cities from 80+ countries) and firm up one’s mind on how their travel is going to look like. Then comes the planning phase, where one can create a plan for themselves in 3 easy steps- select the countries and cities, place to stay, where to eat and what to do and so on. This clear breakup avoids confusion later. Well planned is half done! Once your plan is done, next step is execution. 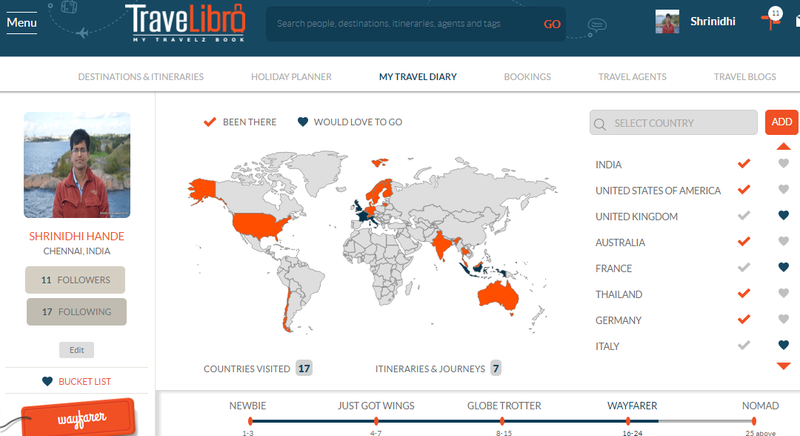 TraveLibro has tie up with skyscanner to give you flight booking and car hires. TraveLibro has its own listing of home stays and hotel booking option will be live soon. Local sightseeing/tour operators are also on board TraveLibro, so that you can book your trip till the last mile. Once back, you can upload your photos, share your experience and your profile will keep yourself and your friends updated about your travel details. On platforms like facebook or twitter, the updates you make are eventually lost in a sea of thousands of other updates- it is hard to group your updates together and preserve it nice. TraveLibro makes it all lot easier, by facilitating end to end travel related activities. TraveLibro is a 2 year old startup started by Monish Shah and has already got critical acclaim from various sites tracking start-ups- Read about their coverage on Travhq and Techstory.in The number of partners and itineraries are growing every single day. The team has a good vision on how their product would help the travel community and are working hard to take it there. When I am headed to a new destination, I religiously refer itineraries posted by others for that city. It helps me fine tune my own itinerary- by including anything I might have missed or by excluding attractions not recommended by others. On my TraveLibro Profile, I have already posted by several of my recent trip itineraries. Australia, Srilanka, Singapore, Lithuania, Helsinki and more. While I break down a trip into smaller topics and cover one at a time in my blog post, if you are looking to know my overall itinerary, then this will help you. This platform sounds very inviting. Hey and that's a very nicely put-together piece, Shrinidhi.